The Liberty Diversity Series of Gold Coins celebrates the unique ethnic and cultural mix of the United States of America. 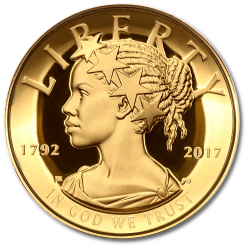 The biennial collection equal began with the release of a high-relief proof 1oz gold coin featuring Lady Liberty as an African-American woman in April 2017. Its reverse showed an American eagle in flight with the coin's face value and purity and the mintmark of the United States Mint at West Point, New York. The coin's debut coincided with the Mint's 225th anniversary and grabbed the attention of the world's numismatists. Each limited mintage release will portray Lady Liberty as women from various backgrounds including Asian-American, Hispanic-American and Indian-American. Struck from one troy ounce of fine .9999 gold, these magnificent limited-edition coins have a face value of $100 US.